Street Cred: Plenty of rappers have said something along the lines of "I Am Not A Rapper, I'm A Hustler Who Can Rap." Eazy lived that mantra. He was a hustler who had no initial interest in rapping (he originally wore his signature shades out of embarrassment), instead putting in work in on the streets, which originally helped him get N.W.A. off the ground. 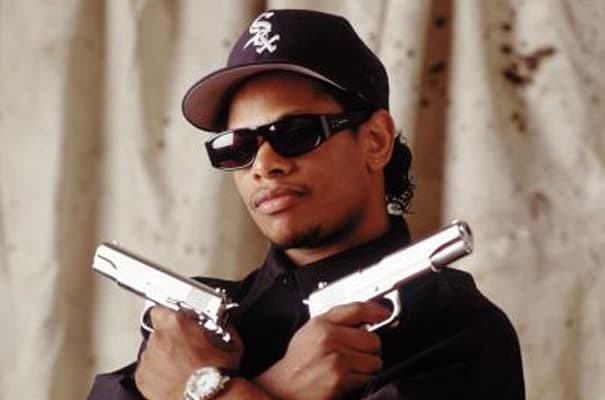 The best part was, according to a profile on him in The VIBE History of Hip-Hop, even after he was rich and famous, Eazy was still selling dubsacks of weed and living in a house full of automatic weapons. GANGSTA GANGSTA THAT'S WHAT THEY YELLING!